Not one college basketball coach has won 1,123 games: not men’s, not women’s, not D-I, not D-II, and not even D-III. The record, as of now being 1,122, isn’t actually held by Coach K yet: Harry Statham, who retired last year from Division II’s McKendree University, just finished off a run of half a century. Coach K win “Kount” stands at 1,121– one behind Statham. Now, with a win tonight and a win at home vs. NC State would make Coach Mike Krzyzewski the winningest college coach of all time. Not much more you can say there except “Wow”. Bleed blue. Catch the Duke-Louisville game at 9pm tonight. Good News for Tre Jones! Duke fans have held their breath for the past week as Tre Jones continued to recover from an AC joint separation suffered early in a loss against Syracuse, but it’s time to exhale: Jones is doing exceptionally well and will be back much earlier than we feared. Coach Mike Krzyzewski described it as “not long-term”. AC joint separations are very dependent on the severity of the injury, and while Jones sustained a very painful injury it doesn’t appear to be horribly severe. Agreed, Barstool Blue Devils. Agreed. His shoulder has “responded well to treatment”, according to ESPN’s Andrea Adelson, though he is unlikely to play against Virginia on Saturday he is day-to-day and not yet ruled out less than 24 hours before the game. Cam Reddish, who did not play due to illness last Saturday, is expected to be available. Bleed blue. All I ask is for you to continue to #PrayForTre! It’s working! 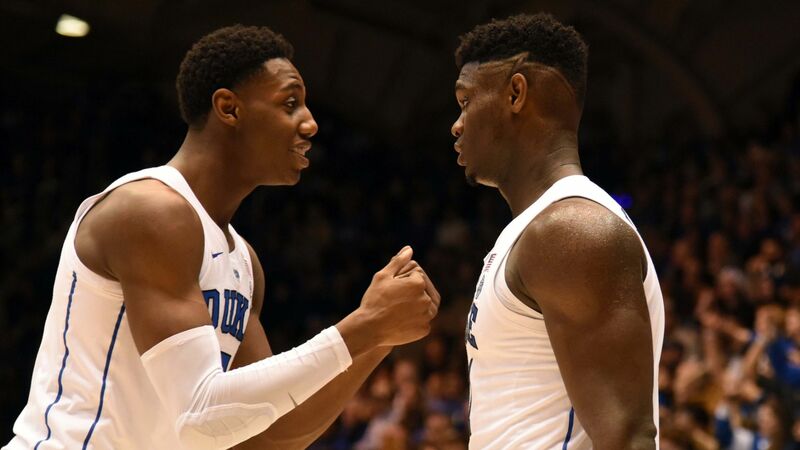 RJ Barrett, 30 points, and Zion Williamson, 20 points, led Duke to a 91-58 rout of Yale. Duke rode its hot second half to rout Yale, 91-58, as Yale just couldn’t handle Duke’s defense and coughed up the ball too much. It was close for a good long while, as both offenses couldn’t seem to click, but Duke got rolling in the second and it was over. RJ Barrett finished with 30, while he and Zion combined for 50 points. Yale turned the ball over 23 times, making 24 points for Duke on the other end. Yale played hard the whole time, though; they’re a tough team and deserve credit. The defense suffocated a Yale offense that is generally pretty good, which is a good sign for a team that is very young. The offense was forced to start further and further back in the backcourt, opening up opportunities for Duke’s backcourt to deny passes and rack up deflections, as Cam Reddish and Tre Jones combined for seven steals on the night. Every starter had one or more steals. Jack White also had an excellent defensive game, with 3 steals and 2 blocks. White helped to hold the Elis’ best player, Miye Oni, to twelve points (down from a season average of 18). The offense struggled in the first half but as mentioned before, it was over the minute that we got it together on that end of the court. Duke will now take a break for final exams (and some snow! ), taking on another Ivy League foe in Princeton in a little less than two weeks. Guess who also has exams? Me! I’ll be studying so Krazies’ Korner may be a little bit behind in case of some big news. Thank you for your understanding. Bleed blue.
.@vernoncarey22 has committed to @DukeMBB. Not much that I can say here other than a great player has picked a great university to play for. Quick profile: at 6’10”, 260, he’s a beast at center and I can’t wait to see him in our Blue and White. Welcome, Vernon Carey, to the Brotherhood. Bleed blue.